Makita Sawzall- Better tools for a better life!! Makita Sawzall has been one of the contributors in the growth and innovation trends of Sawzalls. Their name is synonymous with the advanced motor design, high quality raw material, tools which are reliable and rigorously tested. A presence of 90 years in the industry cannot be undermined! However, their expansion into other field may have left few to complain about their leadership in this line of business! 1. Makita JR305OT: Powered with a 9amp motor which facilitates continuous operation, it has a variable speed for increased cutting efficiency. The speciality of this model is the longer 1-1/8 strokes enabling faster cutting. You are rewarded with greater visibility and accuracy with the help of the internal dust blower system which helps in clearing the debris from the line of cut. This could be used for heavy-duty shoe features and tool-less adjustment. The model includes blade and a plastic tool case. 2. Makita JR 306OT: This model is powered with 12 amp model and is facilitated with a key less blade change which enables changing the blades without touching it. Not only that, Tool less shoe adjustment present enables adjusting the depth of the cut. The sawzall is externally accessible with brushes for maintenance. The model includes blade and a plastic tool case. 3. Makita JR 307OCT: This model has the highest power motor (15 amps) in the Makitas range and hence is very powerful. It has an electronic speed control which maintains constant speed under load. The variable speed dial provides control and this could also presets the speed. A metal case accompanies this model. The maximum cutting capacities of models JR 3060T and JR307OCTare around 130mm (5-1/8) for pipe (metal) and 255 mm for wood. All models have a stroke rate of 0-2800 strokes per minute. The Makita Sawzall could be powered by the Makita LXT Lithium ion battery with an energy rating of 30min full charge producing 430% increase in total lifespan work with 2.5 times more cycles of sawing. The Makita BJR181Z 18V LXT Lithium ion reciprocating saw is very light yet very powerful and is provided with a battery of 45 minutes. 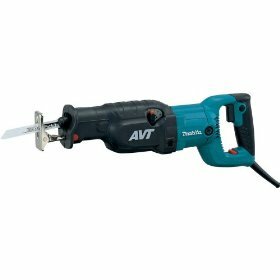 The battery powered cordless Makita Sawzall is good for faster cutting and demolition tasks on a work site. The high torque motor is designed for all kinds of applications. Thanks to the battery power, it makes this tool easily portable or remote use where usual power options may not be available. Return From the Makita Sawzall Page to Home - Finishcarpentryhelp.com.